Customers accessing JT’s 4G mobile network in the Channel Islands using the latest mobile handsets are now experiencing the fastest network. Thanks to a software upgrade JT has recently undertaken. JT’s 4G network was recently independently proven by almost 600 Islanders to be the fastest. Even better, with the scheduled upgrade it further improves the customer experience. In technical terms, the upgrade means that users of the most popular and high-spec handsets, like the iPhone 6S and the Samsung Galaxy S7, are now able to enjoy an even quicker mobile experience. Typically up to 30% faster than before. For example, on the Samsung Galaxy S7 speeds of up to 300Mb/s are now achievable. Meaning this is a new maximum speed that is better than double that of the other providers in the Channel Islands. Thierry Berthouloux, JT’s Chief Technology and Information Officer, said: “When it comes to mobile connectivity, speed is vital. We’re delighted to bring more good news to our mobile customers. Thus, enabling them to experience even faster download speeds using their mobile devices. The Channel Islands have one of the highest penetrations of smartphones in the developed world, and so providing customers with improvements to our network wherever we see an opportunity is something we will continue to do through investment and staying ahead of the latest technology. The 30% faster speeds are achievable when using JT’s 4G network and a category 6 (e.g. Samsung Galaxy S6 or the iPhone 6S) or category 9 (e.g. Samsung Galaxy S7) handset. The previous maximum speed achieved on the JT 4G network was 225Mb/s. Since the upgrade customers could potentially get up to 300Mb/s. The upgrade has made improvement to the speeds for the Carrier Aggregation feature which allows handsets to use more than one frequency band at a time (JT has three bands: 800, 1800 & 2600). Category 6 phones can join two bands together and category 9 phones can join three bands. 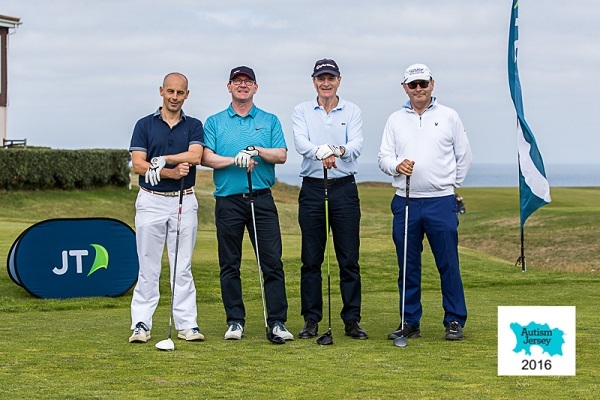 The annual Autism Jersey golf day, sponsored by JT, took place on Friday 12th August at La Moye Golf Club. In total, it raised £15,000 for the charity. Good weather and yet another excellent turn-out ensured the success of the day. A day which involved 22 teams enjoying a round of 18 holes followed by lunch in the Clubhouse. A raffle and auction, including a golf flag signed by 2016 Ryder Cup Captain Darren Clarke, boosted the funds raised. These funds will go directly towards the development of a purpose-built Autism Centre in Jersey. The winning team was Elian with an outstanding score of 104. Followed by Quilter Cheviot with 92 and Ashburton with 89. Meanwhile, individual prizes went to Derren Glover of JT for the men’s longest drive. Also to Alexa Saunders of Carey Olsen for the women’s longest drive. And finally to Martin Smith of Dandara for the nearest the pin. During the lunch the chairman of Autism Jersey, Nick Winsor, told guests that Autism Jersey is on a mission. A mission to provide the support that is needed on the Island. He spoke more about plans for a purpose-built centre for autism in Jersey. A site in Trinity has been identified, and plans drawn up, he said. Thanking JT for their support of the annual Golf Day, he said: ‘Money raised today will go directly to that centre.’ He also expressed his thanks to Autism Jersey’s Patron, Lieutenant-Governor General Sir John McColl who, he said, had been ‘incredibly supportive’ of the charity. Autism Jersey aims to raise at least £1.5 million for the centre in a joint effort with the States of Jersey. The streets of Jersey are being brought to life this August with the sounds of some of the Island’s best young music talent. Thanks to JT’s Music Moments FREE ‘pop-up’ mini-gigs. Organised by the long-term headline sponsor of Jersey Live, JT, passers-by are being treated to impromptu live performances. This includes some of Jersey’s most talented home-grown local musicians, bands and singers at different spots all around the Island. Because of this success more mini-gigs planned for the pavements of St Helier and St Aubin throughout August. “We’ve been really surprised by just how the public have got behind the JT Music Moments idea. It started as a way for us to help provide opportunities for some of Jersey’s brilliant local youngsters to perform their music to live audiences in unusual locations. So far, of the 15 pop-up gigs, we’ve seen a staggering 676 likes from the videos and 15,882 views. Therefore, this shows just how popular these young artists are. We’re running the free gigs right up until Jersey Live. Also, we’re pleased to offer opportunities for more younger people to attend Jersey Live with our new ‘kids-go-free’ customer promotions launched today. Each Music Moment is posted to the JTSocial Facebook. JT is encouraging people watching them to post their own clips of the performances for a chance to win a prize from JT worth £1,000. But, also to help these singers raise their profile. JT has been the headline sponsor of Jersey Live for 11 years. The JT Stage has always provided a stage for local bands and talent to perform alongside seasoned professionals and visiting bands. – FREE WEEKEND ticket for all Pay as you go customers when they top-up £99 in-store at JT. – Refer-a-friend offer for anyone who has taken a JT FREE ticket to also get free food and drink vouchers to the value of £24 at Jersey Live when they refer a friend to JT’s FREE ticket deals.